Weekend Readings – What’s Going On In Wimbledon? Posted in Commentary | Comments Off on Weekend Readings – What’s Going On In Wimbledon? If Your Long Term Retirement Account Isn’t Extremely Boring…. The other day I met a girl who was discussing how she was so excited to be buying Apple and wanted to get involved in Facebook . As you probably know, I’m more than sold on both stocks and would happily buy Apple or Facebook (if it were public). She then proceeded to explain to me that she had 3-4K saved for retirement and investing into those 2 companies would be so “exciting”, it was going to feel as if she were part of these 2 incredible success stories. That is when I had to take a step back. I mean look at my trades, I’ve discussed volatile stocks such as Facebook (FB), trade long and short tech strategies. I also discuss some longer term speculative picks in the tech newsletter. Outside of trading there are also a ton of different and exciting things that I like to do. I do however have a great distinction between the different types of trading. I am willing to risk much more on money that I can afford to lose. For those trading accounts, I am willing to take risks if the expected payout is good enough. For my retirement account, I don’t see the point of trying to make things overly exciting. My goal is simply to have progress over the years, powered mostly by money I can set aside every month, but also a clear and consistent trading strategy. When trying to prepare your retirement money, what are you trying to do exactly? Hit a homerun? Then maybe you could add some penny stocks, wager some money on sports or in a casino even. Personally, as much as I like trading, I have a very clearly defined strategy for my retirement account, one that I know will work well over the long term even though there is absolutely no chance that I will hit a homerun a triple my money over a few weeks or even a few months. Why? Because it’s very clear to me. Honestly, do you care if your retirement account is extremely boring to track? I don’t. There are many different things that can be done. You can build a diversified ETF portfolio that gives you exposure to the main asset classes while also offering incredible diversification, all for a very reasonable price. Another strategy that has been discussed quite a bit is dividend investing, which will build you a steady and growing flow of passive income. I’ve also seen some very successful investors do a combination of both of those in order to gain exposure to different types of assets while also counting on steady dividends. How “boring” is your retirement account? Posted in Investment Talking | Comments Off on If Your Long Term Retirement Account Isn’t Extremely Boring…. In my quest to become financially independent, I try to prepare myself for all scenarios. I’ve certainly discussed my concerns about the economy, government deficits and the fact that depending on the government or any other type of pension is foolish. I do my best to prepare myself for such scenarios but there is a big difference between having a portfolio that can sustain or do well in difficult times and trying to “predict the end of the world”. Yesterday, I was discussing with a friend of mine who is shopping for real estate. He is very concerned about real estate prices in Canada and who would blame him? He’s thinking about waiting a few years for some kind of decline. It’s not a terrible idea and in fact I remember thinking about doing the same thing before buying my house 3 years ago. I ended up deciding not to because it’s so difficult to type the market (no matter what market you’re investing in). Looking back, it’s a good thing that I did not wait. My family and I would still be on the sidelines. That crash has yet to come. It could take a few months, a few years or maybe a while longer. It’s almost impossible to bet or invest based on such scenarios. Ouch! Needless to say that it has not worked out very well. My main takeaway would be that it’s never a good idea to invest a big portion of your assets in an unlikely scenario. I can’t imagine that someone would believe, no matter how negative they are, that the end of the world is a year or two away. So much can happen. Taking part of my savings and investing into such a scenario is something I might consider at some point. But not until I had a lot more to invest in. Instead of trying to move my entire assets to protect myself from a difficult environment, I try to use strategies that will do well in any environment. It’s not a perfect method (because such a thing does not exist) but using strategies such as buying a sustainable and diversified portfolio limit the downside in case of a financial collapse. It’s not perfect but I’d argue that very few of us can afford to always be ready for such an event. Do you feel like your investments provide protection from the worst case scenarios? If not, do you mind? I don’t need to convince you that saying that I like Apple’s stock is not a very popular view these days. It used to be unanimous and for years Apple would still beat expectations quarter after quarter, both on its top and bottom lines. That has obviously changed, and owning or believing in Apple is the type of thing that you almost feel like keeping to yourself. I always talk about the risk vs reward paradigm, and I certainly feel like that is the main case for buying Apple. First off, a few important facts about Apple. What Would Justify Apples Current Valuation? –No New Products: One of the big concerns for shareholders has been the lack of new products. Ever since Steve Jobs left the company, Apple has been living off of its main products (iPhone, iPad, iPod, Macbook, etc) with little to no innovation. There have been rumors that products such as the iTV and the iWatch will soon launch, but those have been going on for a long time now with no results. –Decreasing Margins:There have been rumors of a cheaper iPhone coming to the market and there is a debate over the benefits and downsides of such an approach. It’s unclear how good of a move this would be, but I don’t think anyone expects margins on existing products to improve. The fact is that competing products are getting better and Apple can no longer get away with the margins it enjoyed for a few years in the smartphone and tablet markets especially. For margins to increase, new products will need to become a major part of Apple’s business. Of course, I wouldn’t say that these are foregone conclusions. Tim Cook has already confirmed that there would be many new products launched in the coming months (iRadio was the first announcement just a few weeks ago). Declining margins are certainly a worry, but it’s far from a done deal. Also, declining margins in a market that is growing very strongly (and should continue doing so for some time to come). If Apple is on pace to make $40 or so per share this year in what anyone would say is a down year and that we agree that Apple’s P/E is not going to get much lower, I think it’s reasonable to expect Apple to have a floor that is actually not too far from its current levels. Apple remains an incredibly strong franchise that could end up launching a big new product (such as a TV) in the coming months and that will continue to roll its existing products for some time to come. It’s also very reasonable to expect Apple’s P/E to come back up, which in itself would have a significant impact. I also think its way too early to give Android the victory over Apple. The fact is that there is a clear group of consumers that will continue the closed/simple ecosystem and lineup of products that Apple provides. When I look at Apple, I see a stock with very limited downside, but fairly significant upside, exactly the type of trade that I look for. Today i was reading an article about Tesla and also heard from a friend who has done very well on his Tesla purchase. Then i watched this video which you can take a look at where the Tesla technology is displayed. There is no “next” Steve Jobs. He was unique in every way. However, if you believe that a big part of investing is finding strong leaders that will end up transforming entire industries and make their shareholders rich at the same time, then it seems very reasonable to ask if Elon Musk is the next leader of this century. I find it hard to invest based on those numbers because what i’d be buying is this guy’s vision, the idea that he will end up building something beyond what we’d expect. In a way, this as speculative as it gets. I always look at the upside which is incredible here. The problem of course is that projects like the ones he is taking on usually fail so it’s fair to think that Tesla could simply be the next company that fails to transform the automobile market. Do any of you own Tesla? Would you consider doing so? I’m not a huge NBA fan but I’ve gotta say that it was an amazing final and what a comeback by the Heat, did any of you end up watching it? Congrats to Lebron and the others on another remarkable season!! Tripadvisor was spun off from Expedia over a year ago and from the start I was very excited. I did get burned initially but I’m starting to consider it for my next long term speculative pick. It would be a bit outside of my ecosystem philosophy but I’m starting to believe that TripAdvisor will end up becoming the top travel website out there, surpassing giant Priceline (PCLN) and others. We can also compare revenues and growth. I think it’s fair to say that TRIP has a lot of momentum. Of course, that should not be a big surprise. As a much smaller and newer player, it should be growing a lot faster. If it wasn’t, there would be an issue. More critical to this analysis though is the fact that TripAdvisor is increasingly becoming the starting point for travelers trip planning. Just look at traffic to its websites and you can see what I mean. As they continue to build around a strong community, the website is becoming more useful in ways that competitors simply cannot challenge. The plan seemed to be to build a great product/community at first that would provide the community with a comprehensive number of reviews no matter what you were looking into. Then, they made it easier to see where our friends have been (as well as our extended friends) thanks to its Facebook connect link. Now comes the best step from a shareholder perspective, TripAdvisor is making it easier for users to book their trip by providing them prices and other means. As TripAdvisor continues to create relationships with these millions of hotels, restaurants and other local businesses by helping them interact with users, give relevant information and more, they will also open the door to more possibilities such as helping users book (eventually), letting businesses advertise more easily, etc. The possibilities are significant and very difficult to compete with for competitors. 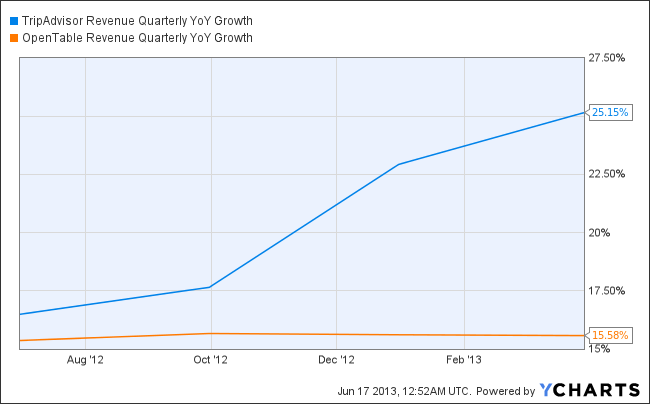 Does TripAdvisor look cheap at its current valuation? Not exactly. But I do think the potential for growth is very significant and am strongly considering getting in on the action. There isn’t much to report this time around. The only big news is the announcement by Dover that it will spin off some of its communications technology businesses which seems to have helped its business. I will be selling off that business when it happens to buy back Dover though… more on that later on. Things continue to go very well and the USDP continued to outperform the S&P500 giving an extra cushion…! How did I manage? One stock that has done very well is DOV, just look at the chart below so far this year. Not much to report. I ended up buying shares of every stock that paid out dividends and needed to use most of my $1000 monthly cash investment for that reason. Nothing else to report. It was a fairly slow month but I do feel like things are getting much clearer. Why? I’m convinced that I want to carefully start investing on margin and build my own mini-Berkshire empire. It’s been tricky to save as much in the past few weeks so I’ll be putting more focus on reducing my spending to set more aside. 5.46% – Dividend/Investing Portfolio: I am currently generating a dividend yield of about 3.43%. This portfolio will be increasing over time. I use a bucket system which I will be writing more about but the main retirement components are a long term dividend portfolio (see the Ultimate Sustainable Dividend Portfolio) and an ETF portfolio (see BuildYourETFPortfolio for more details on how I build mine). I saw a slight increase here thanks to markets rising and a similar yield. I love seeing that little blue line above the red one, it’s a very nice thing to see:) The trend isn’t as convincing but I do expect that my trend will be flat and then have some nice bumps as I start building new trends! TripAdvisor was not at the top of my top social web stocks earlier this year but I’ve always held it in high regards. The company is quite possibly the best positioned travel website out there which is saying something when you consider rivals such as Priceline (PCLN), Travelzoo (TZOO) and others. When I look at the numbers above, I see two comparable stocks but TRIP just seems more attractive no matter what metric you’re focusing on. OpenTable is a stock I’ve been very hesitant to trade. I do know the product very well and like many of you I’m sure, am a regular user. It’s a great product and I do think the company will do well over time. That being said, I don’t see anything that would justify its current P/E ratio that is almost identical to TripAdvisor. The company will struggle to keep up strong double digit growth and I do think it’s a stock that has significant downside at its current level.